Posted on September 21, 2009	by Michael Gorton, Jr. 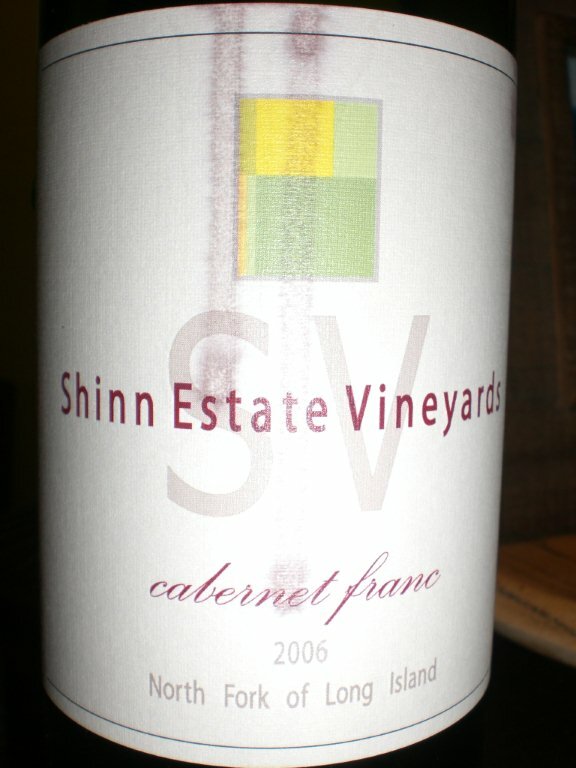 The first tasting in this “Franc’ly I Give a Damn” week is from Shinn Estate Vineyards. This is their 2006 Cabernet Franc. This year was not the greatest on Long Island for red wine. It was rather cool and damp, from what I have been told (I was not paying attention to things then). However I do not think the weather was a factor with this bottle. This wine is taken from three selections of Cabernet Franc and aged for 16 months in small French oak barrels. There were less than 100 cases produced. On the nose I was getting some cherry, and a touch of prune. There were some subtle spices here, a little cardamom, some dried herbs and a slightest touch of violet, and it took a while for that to show. The taste was really nice and there was a lot going on. I was getting some cherry, blackberries, tobacco leaf, some earthy tones, some mineral, maybe slate. There were some cedar notes and I was getting a nice herbal note at the back of the wine. There was some nice acidity to the wine and it had soft tannins. It was a full body wine that had a nice peppery finish that lasted for a while. I was also starting to pick up some of the very nice green elements that are popular for the Cabernet Franc wine. There was a touch of fresh basil that was coming through after the peppery finish. I would recommend this wine for you to pick up. I did have this wine alone, but I have had this with roasted chicken, a rib eye steak, pork and duck. My favorite is with pizza. The only drawback is the price, for $39, though it is justified, it may be too pricey for pizza. However, if you can ever attend their Shinn-Dig Future events, then pick this up at a very good price. To sum it up, this is how I like my Cabernet franc. I prefer it to be a bit green on the back end of the wine. Not right up front. I love the floral and fruit aromatics of this wine along with the subtle earthiness. Shinn Estate Vineyards 2006 Cabernet Franc is my go to Cabernet Franc. You’re right, Michael…2006 was not a good year for reds, particularly cabernet franc. But, those sorts of generalizations are always proven wrong by some wines — this being one of them. I really like the spicy edge of this wine. I wish it were in the 20-buck range rather than $38 though. Makes it hard for me to drink it very often! Have you broken down and popped that 07 yet? No not yet…but I will sometime this week. I also agree with you, the only downside is the price. But I understand the price, small amount produced and aged in French Oak. You will see later in the week how I was surprised and now understand why and think that maybe Cab Franc, depending on the year, should be stored in stainless. Chris from Browders pasture fed chickens just dropped off an eight pound chicken. I can’t decide between turning it into Gumbo or Coq au vin. Either way the CF will be there. Thanks for the thoughtful words on our favorite SEV wine. Thanks David for the comment. And you are welcome. I’ll take the Coq au Vin. Good producers will make good wine even in bad years.